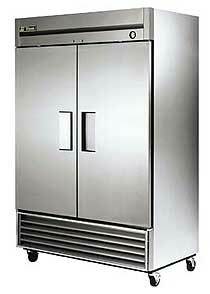 A 2 door Refrigerator is definitely one of the most commonly used pieces of equipment in restaurants and commercial foodservice operations. This one is the standard in the industry. Made by True right here in the US. The Front doors are made from the finest 300 series Stainless Steel. It has an Oversized, factory balanced, refrigeration system that holds temperature from 33F to 38F for better food preservation. Adjustable, 6 heavy duty PVC coated shelves. 2 positive seal self-closing doors. Lifetime guaranteed door hinges. Bottom mounted compressor will work less hard as heat rises in your kitchen. The interior is smooth , easy to clean white aluminum. Flat top can be used for storage. Easily accessible condenser coil. 2 swing doors. Close to 49 cubic feet. The new HC model features the latest in energy efficient technology with R290 Hydrocarbon refrigerant that hat has zero ozone depletion potential (ODP) and three global warming potential (GWP), as well as 3 Low-E thermal glass hinged doors and a foamed-in-place cabinet that uses a high density, polyurethane insulation. ENERGY STAR qualified. 120 volt. Extra large evaporator coil balanced with higher horsepower compressor and large condenser; maintains 33°F to 38°F (.5°C to 3.3°C) for the best in food preservation. Lifetime guaranteed recessed door handles. Each door fitted with 12" (305 mm) long recessed handle that is foamed-in-place with a sheet metal interlock to ensure permanent attachment. Sealed, cast iron, self-lubricating evaporator fan motor(s) and larger fan blades give True reach-in’s a more efficient low velocity, high volume airflow design. This unique design ensures faster temperature recovery and SHELVING shorter run times in the busiest of food service environments. One year warranty on parts and labor, 4 years on compressor.